Health Impact Assessment (HIA) is defined as a combination of procedures, methods, and tools by which a policy, program, or project may be judged as to its potential effects on the health of a population, and the distribution of those effects within the population. HIA identifies appropriate actions to manage those effects. The HIA Toolkit helps support the HIA process by providing free access to environmental and health data to planners, decision makers, and the public; mapping and visualization applications; and assessment of impacts that will showcase how to integrate an assessment of public health impacts within a greater, dynamic movement towards sustainability in our region. The built-in assessment checklist addresses topics such as water quality, social capital and physical activity and injury prevention, among others. 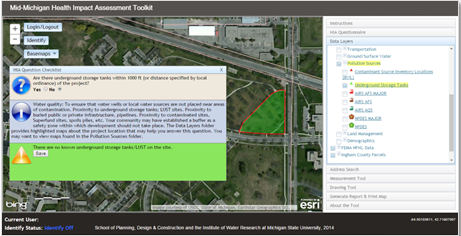 The toolkit was developed in partnership with the MSU School of Planning, Design, and Construction.